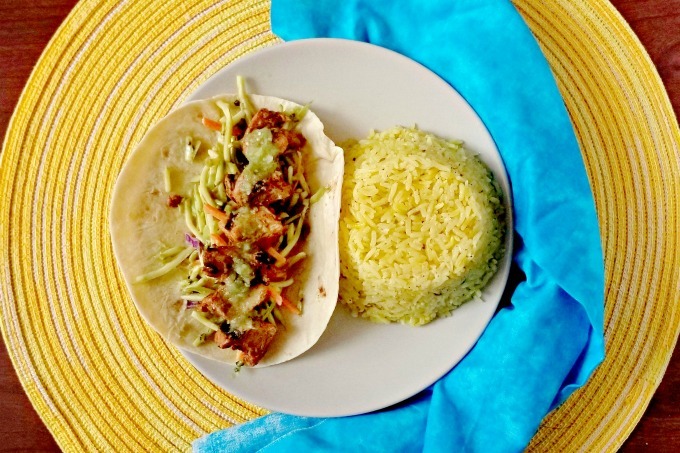 Grilled Chicken Tikki Tacos are full of tikki masala flavor, curry broccoli slaw crunch, and cumin toasted rice. There’s so much flavor your taste buds will be overwhelmed, but in a good way! These tacos are sponsored in conjunction with #BBQWeek. I received product samples from sponsors to use in creating #BBQWeek recipes. However, all opinions are mine alone. 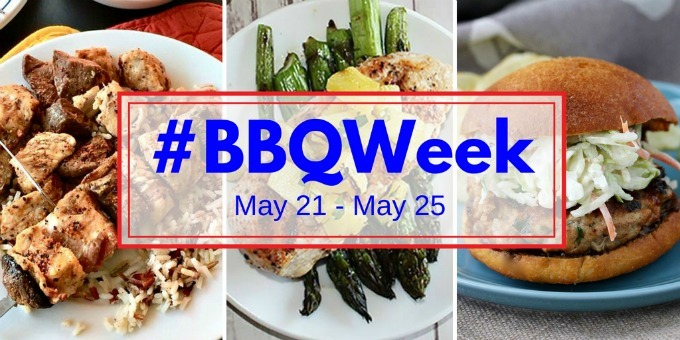 Have y’all been enjoying #BBQWeek? I sure am. There’s been some delicious recipes shared this week already. I can’t wait to see what the rest of the week has in store!! I was off last week. You know how hard it is to get back into the swing of things after you’ve had a week off? It’s even harder for me because no one does my work while I’m out. Well, that’s not entirely true. One thing got done and that came in after I left. So, does that count? And then my bosses act all surprised when I tell them we can’t pay the bill because the one task wasn’t done. Religiously. Every year. I don’t get why it’s a surprise to them. This happens EVERY FRICKIN YEAR!!!!! Yes. I’m venting about work. Sorry. I honestly have no idea what in the world they’re going to do after I leave. They have assigned no one to learn anything that I do. Like, the things that only *I* do and the bosses don’t even know anything about. Sort of tells you a little bit about where I work and the leadership there. But, I’m going to term out come early next year so it’s not going to be my issue for much longer. That is if I don’t find a job before then, which I know I will. I have mad skills and lots of awards to show for it. One HUGE award that went all the way up the chain and impacted a country and its people type of award. And no, I’m not bragging. I legit helped prevent human trafficking and exploitation. Okay. Sorry about that brief interlude about my life. Oh, what did we do on our vacay? We went to see Dad in NC and tooled around some consignment shops, thrift stores, antique stores and what not. Dad sells antique glassware and the hubs has picked up the bug, too. It will be something we can do besides hiking together. We are one of those couples that shares a lot of interests and hobbies. Whether it’s something I’ve picked up from him or vice versa, we do a lot of fun things together. Which is good, because it’s just the two of us and the dogs. Yes, he also enjoys cooking. It was a requirement for Mr. AKHA the sequel. And this is not one of those, OMG the sequel was HORRIBLE types of sequels. This is one where it’s leaps and BOUNDS above the original. I’ve discussed this a time or two on my blog. That was one thing I loved about him when I met him. He loved to cook! There one epic birthday dinner where he cooked his infamous Roman style chicken which I then turned into Roman style braised chicken thighs. Last year he made the same dish for dinner because Mom was here. It’s still absolutely delicious every time he makes it. He also makes a killer piccata, tuna casserole, and the best grilled anything ever. He’s the total grill master at our house. Not that I can’t man the grill, but he’s better at it than I am. I always give him a shout out when he’s the one grilling what I put on the blog. Which is pretty much everything for this week. I love how he’s such a sport with the meals that I cook up for the blog. Like the sloppy eds and all the meat free meals I tried to make. I thought for sure he was going to put his foot down with some of the recipes for brunch week, but he truly did devour that quiche! But then again, he loves asparagus. Stay tuned for more asparagus recipes this week. Heck, some of them I’m even worried about how’ll they turn out, but there’s only been one or two recipes in all these years we’ve been together that have been COMPLETELY inedible. I mean, throw out they taste horrid inedible. Which isn’t such a bad track record. Some of the have been, meh. It’s food let’s just eat it and get it over with. Some have been, this is pretty good. I’d eat it again. And then there’s the, “HOLY COW this is the best thing I’ve ever eaten or you’ve ever made and we can have this every day please.” Of course, those usually include steak. Or in the most recent case, it included Michigan Asparagus. Those are the moments I always strive for. Okay, remember what I said yesterday about the photos? They’re not the greatest. I lost my great picture window with the amazing, diffused, natural light. So, please don’t let them deter you from making this recipe. Along with the chicken souvlaki kabobs with cucumber feta pasta salad, these taste better than they look. And they’re marinated with a yogurt based sauce making them super tender and delicious. Just like those kabobs. On top is a little jalapeno sauce I put on them. You see, I forgot to grab some tortillas from the house when I left for work that day. In order to have these tacos for lunch I had to find me some tortillas to buy. Surprisingly enough, District Taco sells them in packs of two. And they were not expensive! Not only did I get tortillas, but a little sauce to garnish them with. I also bought some delicious beans to go with the cumin rice. It was a rather eclectic meal for lunch with the Indian flavors of the tikki masala and the South American beans. The cumin rice could go either way. Just saying. Make sure you see what the other bloggers are serving up for today. And be sure to enter the giveaway! There’s one of three delicious prizes you can win this week! Combine the ingredients for the marinade in a mixing bowl. Add the marinate at least one hour or overnight. Combine the ingredients for the slaw in a mixing bowl. Cover a refrigerate until ready to serve. The longer coleslaw sits the better. Thread the chicken onto pre-soaked skewers. Grill on medium-high heat 5 to 7 minutes per side or until the chicken is cooked through and no longer pink in the center. While the grill is still warm, heat the tortilla shells on the grill until warm and slightly crispy on the edges. While the chicken is cooking, heat a medium sauce over high heat. Toast the cumin seeds until fragrant; about 25 to 30 seconds. Add the chicken broth and bring to a boil. Add the ground cumin and rice. Bring to a boil and then reduce head to medium-low and simmer 20 to 25 minutes or until the rice is cooked to your liking. Stir in the butter. Salt and pepper to taste. Keep warm. Divide the slaw evenly between the 12 tortillas. Top each tortilla with one skewer of chicken and serve with the cumin rice. This is just the kind of tacos I simply LOVE! Looks absolutely delicious! The chicken sound wonderful, and that slaw – such a great way to sneak in a veggie! The hubs thinks I’m off my rocker for serving slaw with tacos. I’m doing it again tonight with al pastor tacos. These sound flavorful and really delicious! 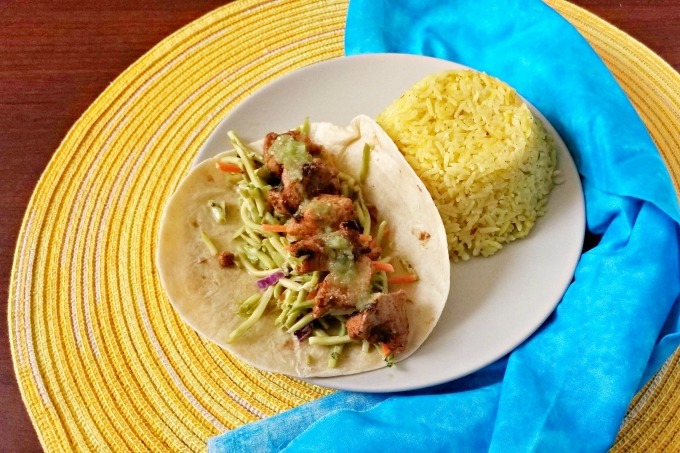 We are so boring when it comes to tacos, definitely need to switch it up and try these! We’re anything BUT boring with our tacos. I love a mashup recipe with them like my Americano which are just bacon cheeseburger tacos. I really need to up my taco game…these look so good! Always love new ideas for Taco Tuesday! They look amazing! Wishing I was at your house for dinner. These look fab and I’m definitely trying them soon! Tikka tacos sounds like a game plan to me.